In this Darksiders III Trophy Guide, we’ll be showing you what all the Trophies and Achievements there are in Darksiders III as well as how to get them. Darksiders III is the third installment of the Darksiders series featuring Fury, one of the 4 Horseman of the Apocalypse. This hack and slash action-adventure game is developed by Gunfire Games and published by THQ Nordic, and will be released on November 27, 2018 for PC, PlayStation 4, and Xbox One. 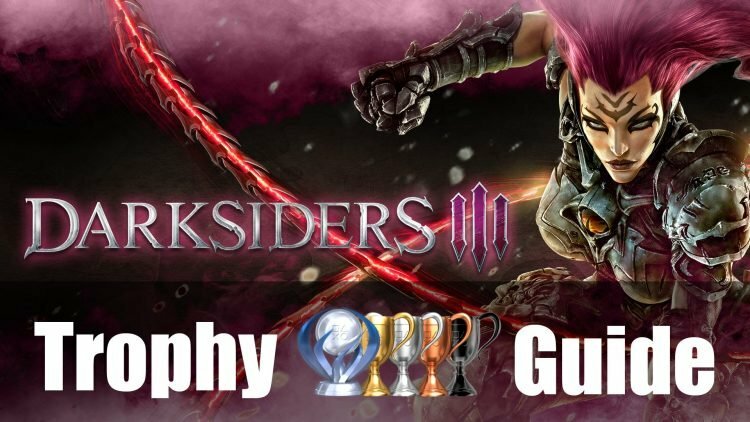 Use this Darksiders 3 trophy guide and roadmap to achieve platinum or 100% the game as we sink dozens of hours in the title to collect the 50 trophies of various difficulty. Upgrade a single weapon to max. Players will need several silver, fragments, pieces, and chunks of Adamantine. See our All Chosen Location Guide for other locations. Feed 800 souls to Vulgrim Plinth to gain an attribute point. Slay Abraxis and go back to the Lord of Hollows and spare his life to obtain. Stay tuned for more Darksiders III content as we cover Collectibles and Builds. Could someone confirm if the game has any missable trophies please ?